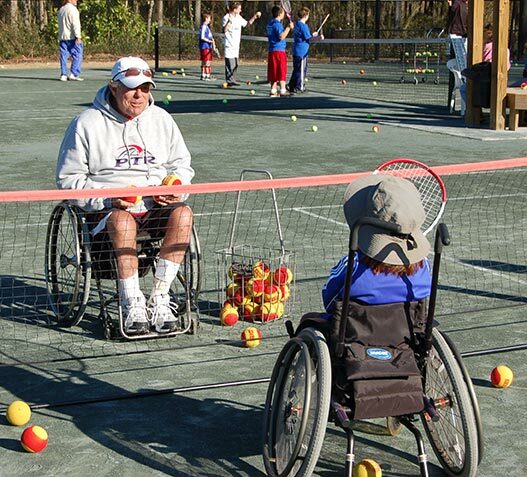 The evolution of wheelchair tennis continues. John Johnston, a 63-year-old tennis wheelchair player, made his second career appearance in a USTA League National Championship this weekend. The resident of Gainesville, Fla. represented the USTA Florida Section Super Senior men’s 6.0 team and helped his team advance to the semifinals at the Surprise Tennis & Racquet Complex. Johnston, a Vietnam War veteran, began playing wheelchair tennis in the mid-1970s and went on to become a world-class wheelchair tennis player, traveling around the world and achieving a career-high singles ranking of 24 in the world. In 1990 Johnston captured a doubles title at the Japan Open with Brad Parks, a member of the International Tennis Hall of Fame, who is considered one of the pioneers of wheelchair tennis. Johnston became the first wheelchair player to play USTA League tennis approximately 20 years ago and played in his first USTA League National Championship at the Senior level in 2004. When Johnston plays with able-bodied players, he wants to show that he deserves to be on the same court. He told the story of his first match against an able-bodied player years ago who said he wouldn’t hit the ball hard at him. On the first point of the match, Johnston set the tone as he slammed a shot at his opponent who had approached the net.